Cheap screw-down metal roofs will leak eventually. RoofCrafters most often installs standing seam metal roofs — roofs that can last a lifetime — yet we are frequently called upon to repair or replace “screw down” metal roofs. While we are happy to offer this service, we often have to explain to an unhappy property owner that not all metal roofs are created equal. Metal roofs that require screws to be shot through the metal panels rely upon washers to create the necessary protective seal. Unfortunately, hasty installation and fluctuating temperatures often cause these to crack or break. When this happens the seal is broken and leaks occur. Even if the outside temperature is only 90°, the temperature of a metal roof can easily be over 140°! Imagine how much hotter it gets when it’s 105° out. Thin pieces of metal, like washers, can’t stand up to the years of expanding and contracting in extreme temperatures without becoming damaged over time. Problems may occur as quickly as 6 years and more often within 12 years after installation. 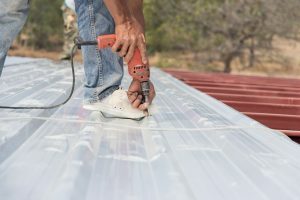 At this point the home or business owner has three less-than-ideal choices: 1) take every screw out and put in a larger screw (an expensive solution that will need to be repeated eventually); 2) put a coating over the entire system (often unsightly); or 3) tear the roof off and put a standing seam roof down. Clearly, it’s better and more cost effective when a roof is done right the first time! Need a metal roofing repair — or interested in learning more about standing seam metal roofs? Fill out the brief form on the right, or or give us a call to schedule a consultation with our roofing repair and replacement pros.